From wild boar and deer on the dinner table to intricate glass they traded, the lives of pre-historic people living near Peterborough has been revealed thanks to the incredible discoveries at Must Farm. Archaeologists have now finished their excavations at the site, located at Whittlesey - and have pieced together the daily lives of a Late Bronze Age (1000 - 800BC) community through a number of extraordinary finds. The 10-month excavation, which is now coming to an end, has revealed how Bronze Age houses were constructed, what household goods they had, what they ate and how their clothes were made. The specialist team working at the site, have uncovered the finest collection of Bronze Age fabrics and one of the largest collections of Bronze Age glass ever found in Britain. They have also found an unprecedented array of household goods, from complete sets of pots, some with food still inside, to wooden buckets, decorative textiles and decorative beads made from glass, jet and amber showing they were trading with Europe and the Middle East. The £1.4 million excavation was funded by Historic England and Forterra, and carried out by the Cambridge Archaeological Unit, Division of Archaeology, University of Cambridge. David Gibson, Archaeological Manager at the Cambridge Archaeological Unit, Division of Archaeology, University of Cambridge, said: “The exceptional site of Must Farm allows you to visit in exquisite detail everyday life in the Bronze Age. “Domestic activity within structures is demonstrated from clothing to household objects, to furniture and diet. These dwellings have it all, the complete set, it’s a ‘full house’”. 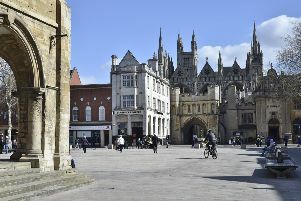 Now Historic England is working with Peterborough City Council and other organisations to determine the best strategy for using and displaying the archaeological finds. The incredible artefacts discovered in the Roundhouses at Must Farm are not the first ancient finds to be discovered at the quarry. Five years ago Bronze Age log boats were found in the peat at the quarry. The boats, which are up to nine metres long, were labelled as one of the most significant archaeological finds in the country when they were dug up in 2011. They have been transferred to Flag Fen – the Bronze Age site uncovered by Francis Pryor – the archaeologist who is well known for his appearances on Channel 4 show Time Team. And an even older discovery at the quarry was also making waves earlier this year. A plesiosaur skeleton was found at the site in November 2014. The skeleton of the creature, which has been named Eve, was 165 million years old, and was taken to the Oxford University Museum of Natural History for further tests to be carried out. It is now being studied at the museum and may prove to be a previously unknown species of plesiosaur. Other plesiosaur bones have previously been discovered at the site. Discussions about what to do with the latest finds are still ongoing. It has been revealed that Peterborough MP Stewart Jackson has secured a debate in Parliament regarding the development of the Flag Fen Bronze Age Park in Peterborough. The debate will take place on Wednesday, July 20 at 4pm.